Do you ever feel like your life has slipped into shades of gray? You peer at your problems and they all seem familiar, as though they already happened. Deja vu. You’re in a rut! Maybe you need color! Brain research says one of the best ways to energize your creativity is to supercharge your brain by doing something new. 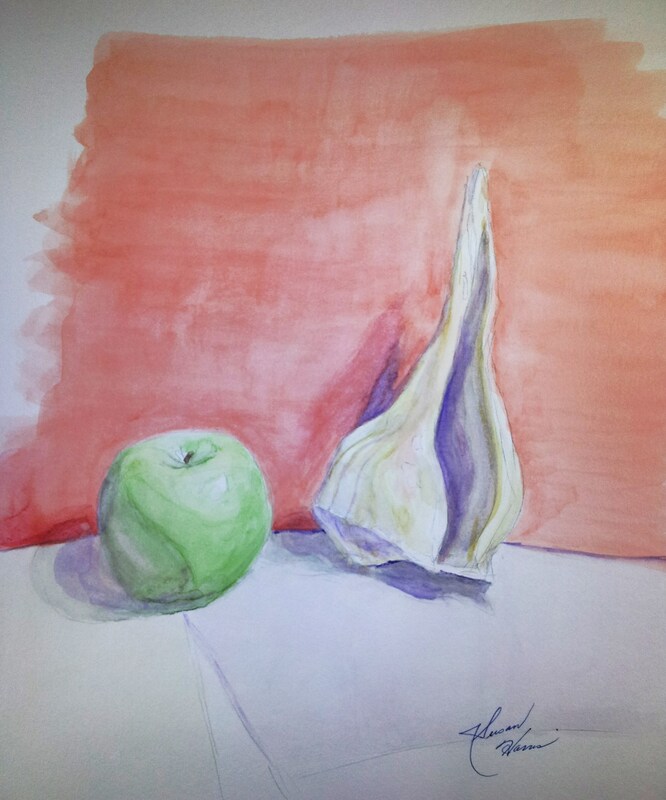 Recently, I took five days out of my routine to take a 15-hour watercolor painting class. Granted, not everyone can take 15 hours or more out of a week or a month or a couple of months, even in the summer, but if you can, it might change your perspective–especially since art requires fresh eyes. First, you want to find an instructor who is a good painter as well as a good teacher. You can’t know about the teaching unless you know former students, but you can easily check out the products the teacher has produced since most instructors maintain access such as a Facebook page or website for prospective art buyers or students. You want someone who can start you out with good, solid technique and whose products you admire. 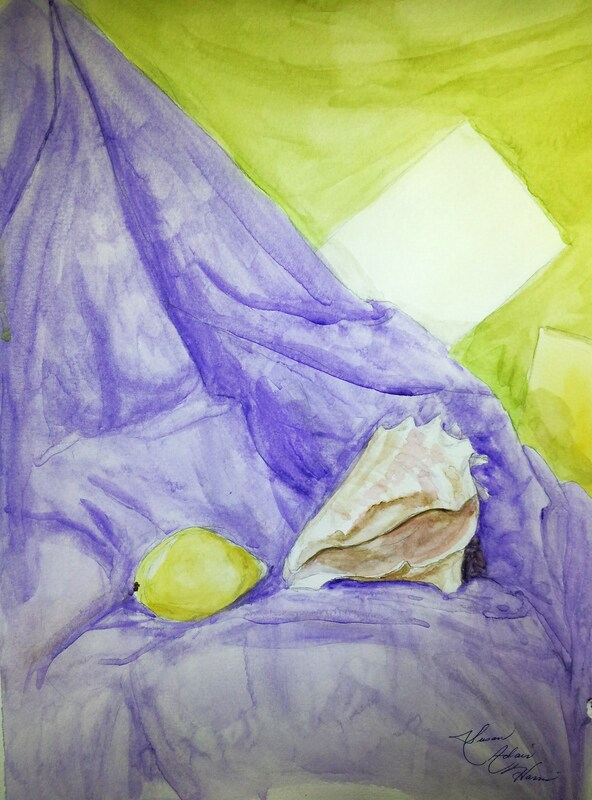 Both drawing and painting require that you look at the world around you in a slightly odd way–especially if you intend to create a watercolor painting. You look for highlights (which you isolate on your fancy watercolor paper like bad children sent to time-out) and shadows, which you note. You sketch the important lines of your subject in pencil, trying not to erase because it disturbs the coating that makes your paper so expensive. Warning: an interest in drawing may re-ignite your old penchant for doodling! You start staring at the proportions of things like faces where the eyes and nose are in a different spot than you would expect and hands are HUGE. But you don’t have to begin drawing by tackling human faces. You can start with apples. Or garlic. Color is sneaky. It changes rules when you’re painting as opposed as when you’re blending colored lights on the patio or stage. 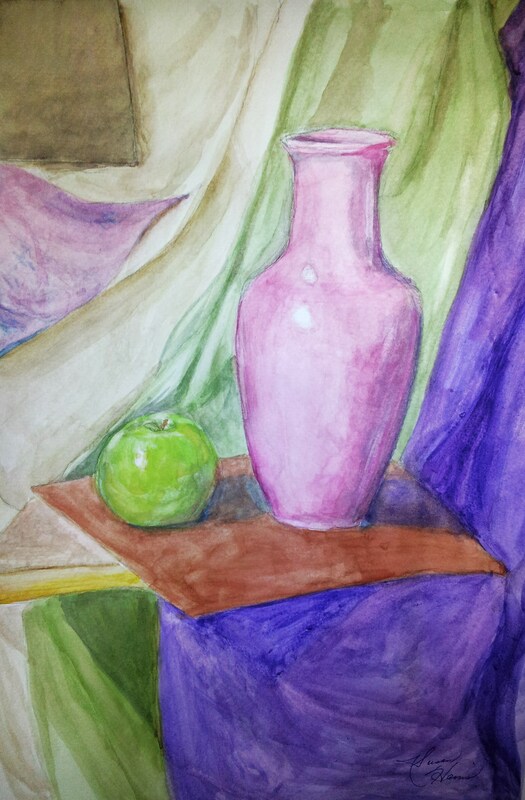 And watercolors demand different color techniques from acrylic or oil paints. In watercolor, you add a color that’s from the opposite side of the color wheel when you want to deaden a color or create a shadow, and you do it right on your picture. It’s scary. All forms of art are probably going to require special equipment at some point. Watercolor painting is easier if you have cold press paper and at least a couple pricey watercolor brushes (different from oil brushes, but you have to believe the package labels if the difference doesn’t show). A good craft store will have a nice set of 16 watercolors in a box like one you used in grade school, but you can also buy individual tubes of color that end up being more expensive. If you don’t want to start with watercolors, how about a drawing class with bits of charcoal or maybe different pencils? Or pastels? Or colored pencils? You can match your financial comfort level to your interest. You’re no artist. You’re judging from your past when you may or may not have had good instruction. But let’s assume you’re right. What’s the point in taking an art class when you aren’t an artist? Besides changing your perspective and challenging a neglected portion of your brain, learning art gives you a chance to step out of your regular concerns–a kind of meditation, perhaps. It gives you a chance to meet other people who are as filled with bravado as you were when you signed up. You’ll have people to share your chuckles when your products are funny. And you’ll have your very own artwork to display on the refrigerator! For more information on my instructor, or to see his professional work, please visit www.VilasTonape.com. This entry was posted on June 14, 2014 by Personal Journeys with Gramma in Life Stories and tagged Adventure, Art, Challenge, Color, Creativity, featured, Highlights, Life Stories, Openness, Permission to Learn, Perspective, Re-energize, Regrouping, Shades of Grey, Shadows, Social Interaction, Something New, Supercharged Brain.